Easiest way I know is: switch a value in a selection box and Visual studio does the changes for you. However my situation was that I had several configuration files I would have to convert. This code runs the steps from: http://msdn.microsoft.com/en-us/library/dd483478.aspx on all files ending with .config in the current folder. Make sure you have them backed up. 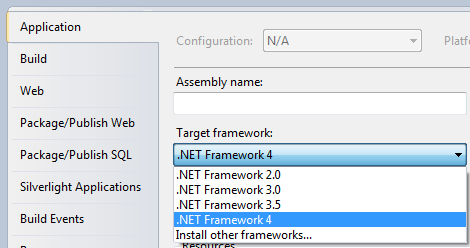 Step 1: Make sure that the application currently targets ASP.NET 3.5! Step 9: If you have customized the Web.config file, and if any customizations refer to custom assemblies or classes, make sure that the assemblies or classes are compatible with the .NET Framework version 4. Step 7 is: Delete everything between the system.webserver section start and end tags, but leave the tags themselves. But in fact retargeting a Web project from the project property tab with Visual Studio 2010 does NOT remove all child elements! // 2 - Open the Web.config file in the application root. // 3 - In the configSections section, remove the sectionGroup element that is named "system.web.extensions". // 4 - In the system.web section, in the compilation collection, remove every add element that refers to an assembly of the .NET Framework. // 6 B - In the system.codedom section, in the compilers collection, remove the compiler elements for c# and vb. // 7 - Delete everything between the system.webserver section start and end tags, but leave the tags themselves. // 8 - Delete everything between the runtime section start and end tags, but leave the tags themselves. Use it in a script if you'd like, to be able to re-target an ASP.Net Web Application from version 3.5 to 4.0.